Does the smell of fresh-baked pizza make you hungry? Or how about the taste of a delicious bowl of pasta? If you are craving Italian food, we’ve got a few places for you to check out. 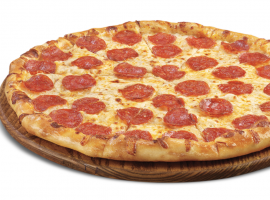 If pizza is your “go-to” Italian food, we recommend Cici’s Pizza, Hook & Ladder, and Pizza World. At Cici’s you’ll find an all you-can eat buffet featuring pizza, pasta, salad, desserts, and more. Their cinnamon bites are simply delIcious. After eating, spend some time having fun in their arcade. It’s a great place for the entire family. Hook & Ladder Pizza Company offers a unique firehouse experience. It is a firehouse-themed restaurant that offers pizza, subs, wings, salad, and desserts. The restaurant also promotes and educates the public about the fire service! Pizza World is another great buffet. From pizza to subs and desserts, everyone will be sure to find something they love. If you’re looking for more of a formal Italian dining experience, Florentina’s and Pasghetti’s offer that. Florentina’s features chef-created recipes including homemade sauces, signature creations, and brick oven pizza. The Italian atmosphere is also very welcoming. Pasghetti’s offers a variety of menu options including: pasta, chicken, salmon, salads, and much more. After dinner, be sure to take a ride on their indoor ferris wheel! With so many great Italian options, it will be easy to find the perfect place for lunch or dinner! Check out BransonRestaurants.com for coupons and additional dining options!